Morning Gold – Handwritten Font is an handwritten script font based on the expression of real handwriting. 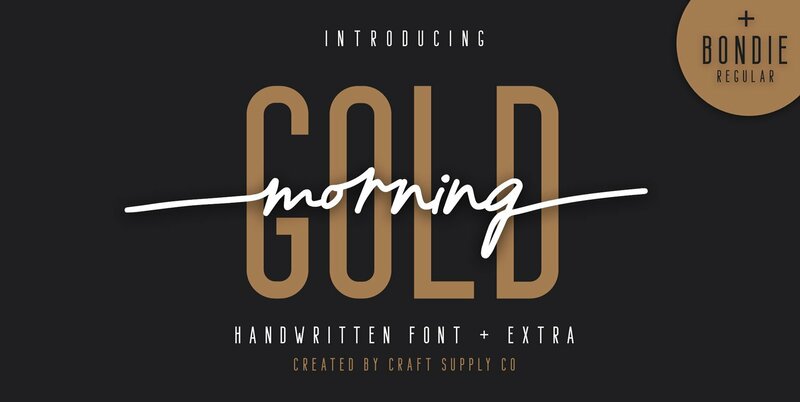 Morning Gold – Handwritten Font + Extra will work perfectly for fashion, e-commerce brands, trend blogs, wedding boutiques or any business that wants to appear upscale and chic. Morning Gold – Handwritten Font also Suitable for Logo, greeting cards, quotes, posters, branding, name card, stationary, design title, blog header, art quote, typography, art, modern envelope lettering or book design, happening style like handdrawn design or watercolor design theme, craft design, any DIY project, book title, or any purpose to make our art/design project look pretty and trendy. No special software is required to use Morning Gold – Handwritten Font + Extra. Published by Craft Supply Co.